Street Law began in 1972, in Georgetown University, Washington DC, when a small group of law students developed an experimental programme to teach high school students about law and the legal system. 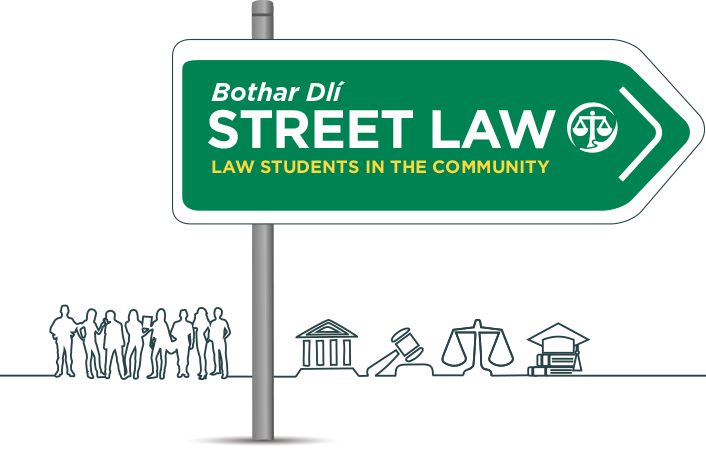 As the programme is in essence a practical course, it was called “Street Law” and it has become an increasingly popular means where third level students help lay people to understand legal issues in an interactive way. Street Law programmes have expanded internationally and programmes now operate in over 40 countries worldwide: throughout Central and South America, Africa, Asia, Europe and the Middle East. The Street Law Programme has grown and developed, from its initial basic lesson plans in the 1970s, to a diverse range of curricula, publications and teaching resources which are generally freely available. These resources are designed to advance the teaching of a variety of legal topics such as the principles of democracy, crime prevention, landlord/tenant issues, family law and employment law and any other areas of interest to a particular audience. Despite the programme’s expansion over the decades, the core focus remains unchanged; law students teaching practical law to students, lay people and communities.